The Wardrobe Theatre resides above the White Bear in a tiny little room about the size of, well, it's bigger than a Wardrobe but it ain't exactly Narnia. Twice a month, the Wardrobe Theatre hosts an evening of comedy with a mix of up and coming acts and the odd familiar face. Last week was a bit different. 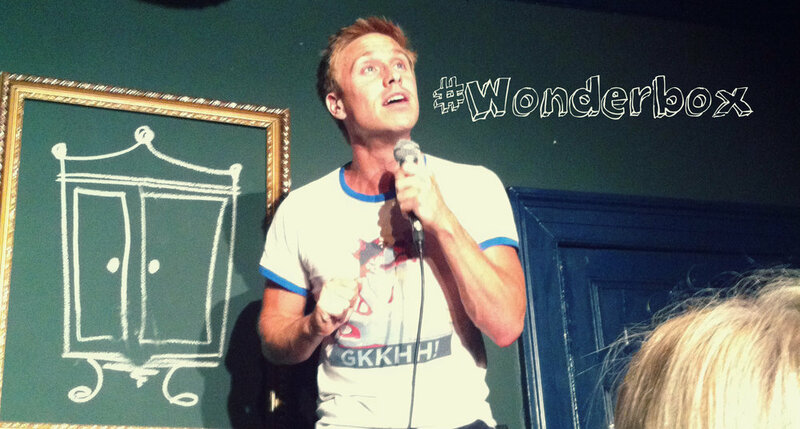 The secret head lining act was none other that Bristol's prodigal son, Russell Howard, back in town warming up for his up and coming tour – Wonderbox. After our names had been crossed off the back of a used envelope we were allowed entry into the tiny room dressed up as a theatre. It was packed full of odd chairs and what looked like retired P.E benches. There were no more than 70 of us making up the audience, all squashed together like sardines, albeit rather middle class, theatre going sardines. Howard likened the situation to what it would have been like if we had been occupied by the Nazi's. Holed up in an attic with a stiff upper lip and plotting the resistance. The compare, a fellow Bristolian, did a wonderful job of making everyone incredibly nervous and look everywhere in the room other than his eyes. I was probably mouthing, ”don't pick me” just about loud enough for him to hear. Luckily, a poor website developer got it the neck and we all sighed with relief. Howard finally emerged to a mix of surprise and smug wry smiles from those in the know. Of course, this was just a dry run for the opening night in a few days at the Hippodrome which is also going to be filmed for a DVD of the tour. The only controversy of the evening was not down to Nazi jokes, or any of the material at all in fact, but from an audience member who was evidently not as thrilled with the surprise headline act as everyone else. He continued to talk throughout the set and when asked what he was talking about, he explained that he was discussing leaving. “Why don't you go home and watch Dave – I'll be on it” replied Howard. I think it's fair to say, he probably was. A lot of content was based around Howard's family. Usually one to pick up on trivial current affairs in search of topical one liners for his TV shows, Howard delighted in constructing these intimate family 'in jokes' that also demonstrated he needn't rely on panel show fodder. The delight in the opportunity to tell these kind of joke was obvious. There were even some jokes about Game of Thrones, which I didn't get (late to the party) but I'm told are hilarious. Some chap called Joooooooohhnnn Snooooooooooooow? If you've got tickets to the Wonderbox tour at the Hippodrome or anywhere else in the country, you are in for a treat. There are still a few tickets available via the Hippodrome website. I also highly recommend getting yourself down to the Wardrobe Theatre for a night of entertainment. Who knows who might be lined up for the next comedy night?